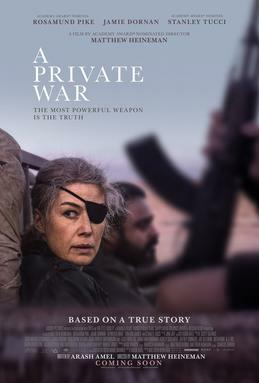 In a world where journalism is under attack, Marie Colvin (Academy Award nominee Rosamund Pike) is one of the most celebrated war correspondents of our time. Colvin is an utterly fearless and rebellious spirit, driven to the frontlines of conflicts across the globe to give voice to the voiceless, while constantly testing the limits between bravery and bravado. After being hit by a grenade in Sri Lanka, she wears a distinctive eye patch and is still as comfortable sipping martinis with London’s elite as she is confronting dictators. Colvin sacrifices loving relationships, and over time, her personal life starts to unravel as the trauma she’s witnessed takes its toll. Yet, her mission to show the true cost of war leads her -- along with renowned war photographer Paul Conroy (Jamie Dornan) -- to embark on the most dangerous assignment of their lives in the besieged Syrian city of Homs. Based on the extraordinary life of Marie Colvin, A PRIVATE WAR is brought to the screen by Academy Award nominee and critically acclaimed documentary filmmaker Matthew Heineman in his pulse-pounding narrative feature debut. To celebrate the early success of the movie released November 9th, we're giving away: A PRIVATE WAR soundtrack CD, Marie Brenner’s book, the official Colvin biography, and a signed poster. The giveaway runs through 11:59pm EST on 12/12/18 and is open to US residents only. For more complete rules see Giveaway Rules. Disclosure: No compensation was received for posting this giveaway. All opinions stated are my own and may differ from yours. See my disclosure policy for more information. Java John Z's is not responsible for prize fulfillment. Sounds intriguing can't wait to read this. Exciting. I'd like to read this story. This story sounds so interesting,scary,brave,and yet it makes me proud all at the same time,I definitely want to see it. I think the story sounds simply amazing. It would take a strong person to dedicate their life to such journalism. Looks like it's going to be an interesting movie. Looks very interesting! !I'd love to see this!